Washing away impurities with water is the key to growing densely-packed, pure carbon nanotubes. 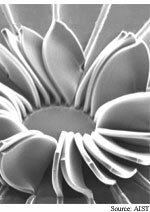 The nanotube forests can be grown in a variety of shapes and patterns, opening the way to widespread use of the much-hyped carbon molecules in microscopic structures and bulk materials. A solar cell that stores the electricity it converts from sunlight promises to power all manner of portable devices. The cell has a sandwich structure that could be made flexible and less than a millimeter thick. The cell is good at harvesting weak light, making it useful on rainy days and indoors. It is relatively easy for humans to sense how engaged a person is in a conversation. Giving computers this ability could improve remote communications and help computers find appropriate times to interrupt. An experimental system begins by tracking your emotions. Silicon is the lifeblood of electronics, but it does a poor job of generating light. Given that sensors and communications devices tend to use light, researchers are looking for ways to make light sources from silicon chips. A prototype silicon laser shows that it is possible. The key is paying attention to the way silicon scatters light. Tight twist toughens nanotube fiber... Multicamera surveillance automated... Chemical keeps hydrogen on ice... Smart dust gets magnetic... Short nanotubes carry big currents... Demo advances quantum networking.